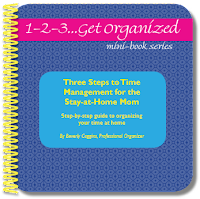 Three Steps to Time Management for the Stay-at-Home Mom is a step-by-step guide to maximizing your time at home. It helps you think through your priorities, passions and gifts enabling you to spend time doing those things you love and that are important to you. Tips on how to take care of your needs as well as those of your family help you maintain your energy level. Also included are ways to manage your time efficiently, work at your peak performance and streamline your shopping, cooking and paperwork. I'm a GFC follower& receive the Mom Audience Newsletter! Thanks for a wonderful giveaway & chance to win! I commented about Entwined Community! Thanks for a great giveaway & chance to win! I commented about the Life Photo Day Planner! Thanks for a chance to win a wonderful giveaway! Thanks for a chance to win this great book! I follow in GFC and subscribe. i am a Fan of Houston Parenting Multiples on FB. I follow you on GFC and subcribe to mom audience! Commented on article Cooking Monster Day on Examiner! Good Post! Time management are more important for children and school students. Parents should take care of their kids activities regularly. There are an infinite amount of tasks, they have to do in a day. Daily activities could also be endless at some days. Implementing some time management techniques, will definitely help to manage and complete all their tasks in a day. Hence, I would like to suggest that parents should use time recording software from Replicon ( http://www.replicon.com/olp/online-time-recording-software.aspx ) for efficient time management.